Lois Lerner is a traitor. Lois G. Lerner is a Traitor. 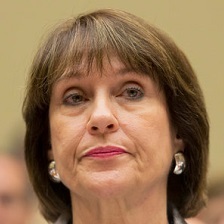 Lois G. Lerner, the Director of Exempt Organizations for the Internal Revenue Service – who refused to testify before a House committee by invoking the Fifth Amendment – has a paper trail that reveals her direct involvement in sending intrusive and harassing questionnaires to Tea Party groups in 2012. Lie No. 1: Lois Lerner’s apology last Friday was a spontaneous reaction to an unexpected question from an unknown audience member. In fact, the question came from tax lawyer and lobbyist Celia Roady. Ms. Roady has some interesting career highlights: She was part of the 1997 ethics investigation of Newt Gingrich, but, more to the point, she was appointed to the IRS’s Advisory Council on Tax-Exempt and Government Entities by IRS commissioner Douglas Shulman. She is a longtime colleague of Lerner, who is director of tax-exempt organizations. Ms. Roady has declined to comment on whether her question was planted, but it obviously was. The IRS had contacted reporters and encouraged them beforehand to attend the otherwise un-newsworthy event, and it had an entire team of press handlers on hand. So what we have is the staged rollout of what turns out to be — given the rest of this list — a disinformation campaign. Lie No. 2: Lerner said about 280 organizations were given extra scrutiny, about 75 of them tea-party groups or similar organizations. The actual number of organizations that were targeted is closer to 500. Lie No. 3: This was the work of low-level grunts in Cincinnati. In truth, very senior people within the IRS, including its top lawyer, were aware of the situation, and had been since at least 2011. The home office in Washington was very much involved in the process. Lie No. 4: Lerner says that the situation came to her attention through allegations from tea-party groups carried in media reports. In fact, the matter has been under both internal and external investigation for some time. Lie No. 5: Lerner says she put an end to the practice as soon as she found out about it. In fact, the IRS continued to do precisely the same thing, only monkeying a little bit with the language: Instead of targeting “tea party” groups explicitly, it targeted those groups with an interest in such esoterica as limited government, the Constitution, the Bill of Rights, etc. Lie No. 6: She says that the commissioner of the IRS didn’t know about the targeting project. While the targeting was going on, Ms. Lerner’s boss was being asked some very pointed questions by Congress on the subject of targeting tea-party groups. He enthusiastically denied that any such thing was going on, in direct contravention of the facts. Ms. Lerner says he didn’t know about the situation, because it was confined to those aforementioned plebs in Cincinnati. But given that this was not the case, her explaining away the commissioner’s untrue statements to Congress is a lie based on another lie — a compound lie, if you will. And acting commissioner Steven Miller was briefed on the situation in May of 2012 — and then declined to share his knowledge of it with Congress when asked about it during a hearing in July. Lie No. 7: Lerner says she came forward with her apology unprompted by any special consideration. In fact, an inspector general’s report was about to be released, making the matter public. Lie No. 8: When Congress was investigating complaints from conservative groups, Lerner told them that she could not release information about organizations with pending applications. But her group was in fact releasing such information — to the left-leaning news organization ProPublica, rather than to congressional investigators. Lie No. 9: Lerner says that there was no political pressure to investigate tea-party groups. In fact, Senator Carl Levin (D., Mich.) repeatedly pressed the agency to investigate conservative groups falling under Lerner’s jurisdiction. What we have, then, is this: Under a Democratic administration, the IRS was under pressure from Democratic elected officials to investigate political enemies of the Democratic party. The agency did so. Its commissioner lied to Congress about its doing so. When the inspector general’s report was about to make these abuses public, the agency staged a classic Washington Friday news rollout at a sleepy American Bar Association tax-law conference, hoping to minimize the bad publicity. Lerner lied to the public about the nature, scope, and extent of the IRS intimidation campaign. That she has a job today is a scandal in itself. She’ll be receiving an award — for public service! — from the Western New England University School of Law on May 18. An orange jumpsuit would suit her better than academic robes. Lerner has been placed on adminstrative leave, reportedly after she refused to resign from the agency. Ms. Lerner, you are a traitor, and have you no decency? At long last, have you no shame? The Justice Department will not seek criminal contempt charges against former IRS official Lois Lerner, the central figure in a scandal that erupted over whether the tax agency improperly targeted conservative political groups. Ronald Machen, the former U.S. attorney for the District of Columbia, told House Speaker John Boehner (R-Ohio) in a seven-page letter this week that he would not bring a criminal case to a grand jury over Lerner’s refusal to testify before the House Oversight and Government Reform Committee in March 2014. The House approved a criminal contempt resolution against Lerner in May 2014, and Machen’s office has been reviewing the issue since then. “Once again, the Obama administration has tried to sweep IRS targeting of taxpayers for their political beliefs under the rug,” said Boehner spokesman Michael Steel. Nevertheless, Lois Lerner along with other treasonous IRS officials are still under investigation by the FBI for the tea party targeting matter — which is a separate probe entirely. This entry was posted in Traitors and tagged Internal Revenue Service, IRS, Lois G. Lerner, Lois Lerner, Traitors, Treason. Bookmark the permalink.